I was about to publish this recipe and realized that maybe some of you out there may have no idea what halwo is. I would humbly describe it as a cool, creamy, almost jello-like milk dessert. Maybe in the same family as Panna cotta, an italian dessert, but a lot lighter and creamier. 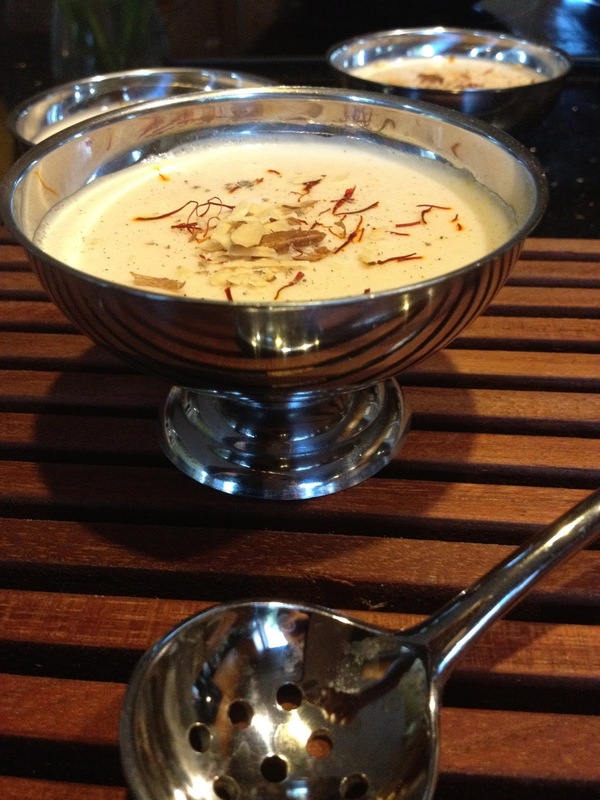 Bring the milk and heavy cream to a gentle boil in a medium saucepan. Turn the heat down and simmer. Mix the agar agar with a little water to make a thin paste and pour into the simmering milk. Immediately stir, being careful not to scrape the bottom of the pan. Continue simmering the agar agar milk for about 10 minutes. Pour in the condensed milk, stir and taste for sweetness. Simmer for a couple of minutes longer. Carefully pour into a large serving dish or individual serving bowls. 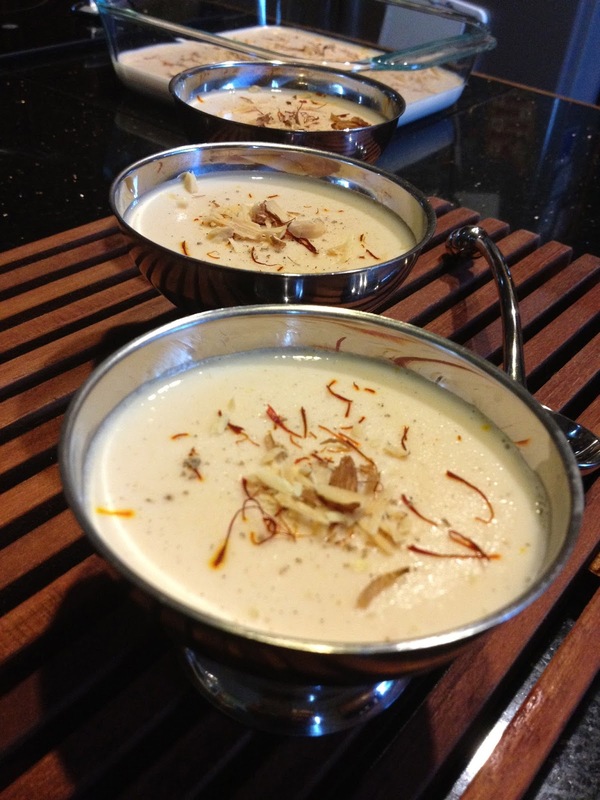 Sprinkle with saffron, cardamom powder and chopped almonds. Leave to set on the counter. Once the halwo has reached room temperature, you may transfer it to the fridge to cool. My favorite part of celebrating the month of Ramadan is having a cool, sweet bowl of halwo, as a reward after breaking my fast. The rich creamy dessert effortlessly slides down my throat. It gently melts into almost nothing making me want for more. I have to warn you it is addictive. If you a sucker like me for creamy desserts, you may not know you have stepped into an abyss until your spoon hits the bottom of the empty bowl. And ‘no’ I am not talking about an individual serving sized bowl, I mean the whole darn thing! As a child, I could not wait for the halwo to cool. Therefore, my mum poured some into a tea cup for me and I would drink it warm. I still do, and its absolutely delicious! I hope you can see the creamy texture from this photo, if not you will just have to make it. You may add a couple of drops of rose or almond essence to halwo before pouring into bowls. It really is a matter of taste. More condensed milk may be added, if you like a sweeter dessert, but I would suggest trying the original recipe first. Please make sure the agar agar powder is a level teaspoon when measuring it. A little too much of the powder may ruin the soft creamy jello like texture of the halwo. Agar Agar powder can be bought on Amazon.com or a good health food store. This is such a quick and easy recipe to prepare. I hope you enjoy making this creamy dessert. I am anxious to hear from anyone out there. Remember dessert is only the beginning…. 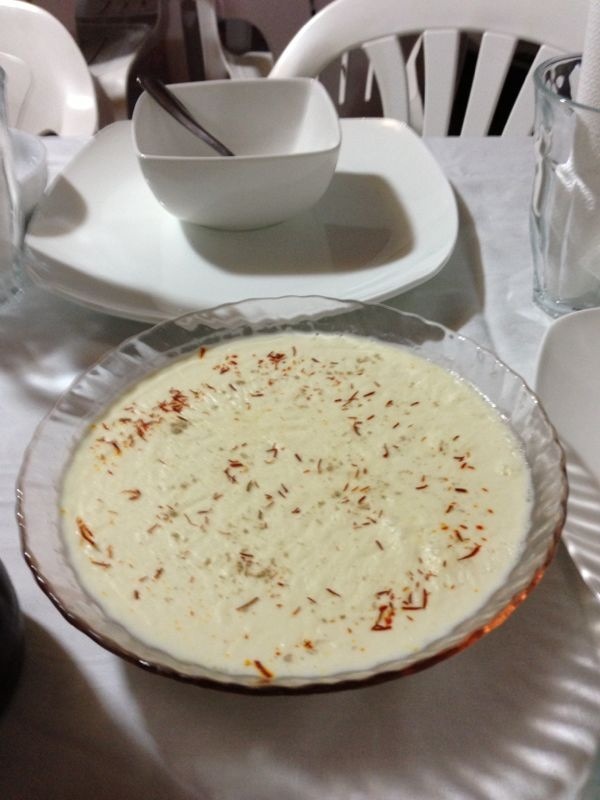 This entry was posted in Childhood Memories, Dessert, Mithai, Sweet Dish and tagged cold dessert, condensed milk, creamy, dessert, falooda, halwo, indian, milk, panna cotta like, sweet. Bookmark the permalink. Thanks Nasimah, let me know how it turns out. I’m late to the party, as always, but it’s the getting there that matters. OH MY DEAR GOD !!! I made this bit of heaven in the beginning of Ramadaan and, now making more. Some to gift. I could live on this alone. Honestly. God Bless you & yours, always. I’m already planning more of your dishes. Hi Shibu! That’s so exciting, I’m happy to hear that you love this recipe. It’s one of my favorites and my mum makes it every day on Ramadaan. Thanks for the much needed blessings! Super creamy and decadent recipe! So easy it’s ready in a jiffy! Give it a shot… you won’t be disappointed! Recipe looks amazing and I can’t wait to try it out. I do have a question though, Can I use the whole agar agar and grind that to a powder form? So the grinding the agar agar to powder didn’t work 😦 It didn’t set. I think I’m going to try it again but this time using halal gelatin. It did taste divine though! Thanks for letting me know how that worked out. I’m glad it tasted good even though it didn’t set. Any luck with the Gelatin? I have contemplated using it but haven’t tried it yet. I appreciated the feedback! Much appreciated. I tried the gelatin and it worked a treat. You do need to use about 5 tsps of it which was just a guesstimate however it seemed to work and was delightful! I made this for my parents and they loved it. That’s so great Shazia! Thanks for experimenting with it 🙂 I’ll remember this when I’m in a pinch. I’m happy to hear that I was able to help. Where did you first try this recipe? It’s always nice to hear these stories from my fellow readers. Chat soon! How many ounces are in the half tin of condensed milk? I wasnt sure if I should get the large or small tin of condensed milk.